Seventy percent of people with advanced dementia live and die in care homes. Multisensory approaches, such as Namaste Care, have been developed to improve the quality of life and dying for people with advanced dementia but little is known about effectiveness or optimum delivery. The aim of this review was to develop an explanatory account of how the Namaste Care intervention might work, on what outcomes, and in what circumstances. This is a realist review involving scoping of the literature and stakeholder interviews to develop theoretical explanations of how interventions might work, systematic searches of the evidence to test and develop the theories, and their validation with a purposive sample of stakeholders. Twenty stakeholders - user/patient representatives, dementia care providers, care home staff, researchers -took part in interviews and/or workshops. We included 85 papers. Eight focused on Namaste Care and the remainder on other types of sensory interventions such as music therapy or massage. We identified three context-mechanism-outcome configurations which together provide an explanatory account of what needs to be in place for Namaste Care to work for people living with advanced dementia. This includes: providing structured access to social and physical stimulation, equipping care home staff to cope effectively with complex behaviours and variable responses, and providing a framework for person-centred care. A key overarching theme concerned the importance of activities that enabled the development of moments of connection for people with advanced dementia. This realist review provides a coherent account of how Namaste Care, and other multisensory interventions might work. It provides practitioners and researchers with a framework to judge the feasibility and likely success of Namaste Care in long term settings. Key for staff and residents is that the intervention triggers feelings of familiarity, reassurance, engagement and connection. Approximately one-third of people over the age of 65 will die with or from dementia and, in the United Kingdom, the majority with advanced dementia will die in care homes [1–3]. Dementia is a terminal neurodegenerative disease and individuals with advanced dementia are likely to have complex physical and psychiatric needs [4, 5]. There is a lack of evidence-based therapeutic interventions for people with advanced dementia. A Cochrane systematic review on palliative care interventions in advanced dementia found only two studies that met their inclusion criteria . Interventions focused on improving end of life care for people with advanced dementia are being developed and tested for use with care home residents . One such intervention is Namaste Care. Developed in the United States Namaste Care aims to address the physical, sensory and emotional needs of people with advanced dementia . It is designed to be delivered twice a day, seven days a week, and as a group intervention whereby residents receive one-to-one attention in a communal space dedicated to Namaste Care . The intervention is focused on sensory stimulation and includes personalized activities to reflect the preferences of individuals . The intervention aims to increase the amount of time staff spend with residents, reduce isolation in people with advanced dementia and improve the quality of living and dying at the end of life. Staff are trained to deliver the programme . There is evidence that Namaste Care can increase social interaction, reduce the severity of behavioural and physical symptoms such as agitation [8, 10, 11] and, potentially, lead to cost savings via a reduction in the use of psychotropic medication [12, 13]. Qualitative evidence also suggests it can increase family and staff satisfaction with care . However, these findings are from non-randomised studies, none of which have compared Namaste Care with other approaches to palliative and end of life care for this population. We do not currently know how best to deliver this intervention or whether benefits can be demonstrated for people with advanced dementia. Namaste Care is a complex multicomponent intervention. Realist review is a systematic, theory-driven approach that aims to make explicit the underlying processes, structures or reasoning (mechanisms) of how and why complex interventions work (or not) in particular settings or contexts [14–16]. The aim of this review was to understand how the Namaste Care intervention might achieve particular outcomes, and in what circumstances. The focus was on the contextual conditions and mechanisms that influence how end of life care for people with advanced dementia is effectively managed in care homes. We conducted a stakeholder driven, iterative, two phase realist review. The approach draws on the work of Pawson [17, 18] and is informed by RAMESES guidance on the conduct and reporting of realist reviews . Realist review takes account of a broad and eclectic evidence base, including experiential knowledge [15, 16, 19]. The purpose of this review was to develop an explanatory account or programme theory about Namaste Care and how it might work for people with advanced dementia living in long-term care settings. Programme theory comprise configurations of context (the background conditions in which interventions are delivered and in which mechanisms are triggered), mechanism (the responses or changes that are brought about through a programme within a particular context) and outcomes. The development of these context-mechanism-outcome (CMO) configurations is iterative involving data collection, theorising and stakeholder engagement. Stakeholders with direct experience of providing end of life care to people with dementia were involved in defining the scope of the review and later in validating the programme theory. To develop our initial programme theory we searched for all available literature describing the implementation or use of Namaste Care. This involved searches in PubMed and CINAHL using the free text term Namaste, and lateral searches of reference lists and a book by Joyce Simard the originator of Namaste Care . We included research studies of any design and descriptive items in non-academic journals. In addition, we conducted face-to-face or telephone interviews with 11 participants involved in delivering Namaste Care, training care home staff in Namaste Care, and researching dementia and/or end of life care. Participants were based in the UK, The Netherlands and the USA. Participants were recruited for their known expertise and through snowball sampling. Interviews were conducted using realist principles  and were guided by a topic guide (see Additional file 1). The purpose of the stakeholder consultation at this stage was to explore assumptions about Namaste Care, including what were considered essential components of the intervention, how it was thought to work and on what outcomes. Research Ethics Committee approval was obtained from Lancaster University 17/wa/0378. These categories became the basis for three preliminary CMOs (see Additional file 2 for details) which were taken forward for testing in Phase 2. All or some participants with advanced dementia. This includes studies where it was based on authors reports and those that provided more formal definitions or used scores such as the Mini Mental State Examination (MMSE). Interventions that drew on similar principles to Namaste Care or included components of Namaste Care identified in Phase 1 (e.g. music therapy, massage, aromatherapy). This included group based or one-to-one interventions. Interventions could be delivered by care home staff or external facilitators. The searches focused on papers published in the last 10 years to reflect the rapid expansion of work and interest in the research area. We searched PubMed, Scopus and CINAHL. Search terms and dates are given in Table 1. In addition, we undertook lateral searching such as forward and backward citation tracking. The purpose of the searches was to identify sufficient evidence for building and testing our programme theory . The test for conceptual saturation was applied iteratively through regular discussion among team members involved in data extraction (FB, JL, RS, CG). . Results of the searches were imported into bibliographic software. Two researchers independently screened the title and abstract of records (RS, JL, FB, CG) and the full text of articles that appeared to be relevant. Papers were assessed for inclusion on the basis of whether they were considered ‘good enough and relevant enough’ [24, 25]. This was an ongoing process that involved discussion between team members. Good enough was based on the reviewers’ assessment of whether the research was of a sufficient standard of its type and if the claims made were considered trustworthy. Papers were judged to be relevant if it was felt that the authors provided sufficient information and/or theoretical discussion to contribute to the programme theories being tested. Studies that were poorly conducted could still be included if the relevance was high, e.g. they contributed to our understanding about how a programme was thought to work. In Phase 1 we extracted information on how Namaste Care was interpreted and delivered, including the core components, and reported outcomes. In Phase 2 we extracted information on: study focus, participants, setting, intervention (including method of delivery and duration), how outcomes were measured and reported, and how underlying assumptions about the intervention were articulated. In a realist review data are not restricted to outcomes measured or results but also include author explanations. For example, discussions can provide a rich source of ‘data’ that helps explain how an intervention was thought to work (or why it did not). Data were extracted into an ACCESS database where the query feature was used to create tables enabling the identification of recurrent patterns of contexts and outcomes in the data and the possible mechanisms by which they occurred. In addition, we mapped the most commonly reported outcomes (e.g. agitation) against data on context and mechanisms. To enhance the trustworthiness of our programme theory we held a second project team workshop (n = 7) to discuss the theory and undertook a second round of stakeholder consultation. This consultation involved discussion of the CMOs and was conducted via telephone interviews (n = 1), face-to-face (n = 2) and email (n = 1). In addition, findings from the review were presented to, and discussed with, a group of end of life care specialists (n = 40) at a community of practice meeting organized by specialist end of life and dementia care organisations. Many of those attending had direct experience of Namaste Care. Stakeholders were from similar groups as in Phase 1 (2 people took part in both sets of consultation). In Phase 1 we found 25 papers relating to Namaste Care, 18 of which provided sufficient information for theory development. The majority were descriptive accounts of Namaste Care rather than research studies. Of the seven research studies three included some before and after data [8, 27, 28], three were qualitative [29–31] and one (reported in three papers) used an action research approach [10, 12, 32]. Only five studies presented data on resident outcomes [8, 12, 13, 27, 28]. The seven research studies, and one further Namaste Care study identified during the Phase 2 searches , were taken forward for inclusion in Phase 2 (see Fig. 1). Core elements of Namaste Care, derived from the literature and stakeholder accounts are shown in Fig. 1 and details of the Namaste Care studies in Additional file 3. In Phase 2 we included 85 papers. This comprised 17 evidence reviews (not Namaste Care) [34–50], 59 primary studies (not Namaste Care) [33, 51–109] and eight Namaste Care studies [8, 10, 12, 27–31]. The 59 primary papers included 24 Randomised controlled trials [59, 60, 64, 65, 70, 78, 79, 81–83, 87, 89, 90, 92–97, 99, 104, 106–108], five non randomized controlled studies [67, 74, 88, 100, 110], three before/after studies [43, 62, 95], ten observational studies [52–58, 66, 68, 109] and ten qualitative studies [71, 72, 76, 77, 80, 84, 85, 101–103]. The rest included a variety of study designs including pilot studies and cross over studies. Eight of the non-Namaste Care included studies [52–58, 109] were conducted by the same authors and relate to two datasets. The study selection process can be seen in Fig. 2, summary details of studies in Table 2, and further details of included studies in Additional file 4 and reviews in Additional file 5. In the Namaste Care studies the programme was delivered by care home staff in five [27–30, 33], by Namaste Care carers in two [8, 12] and activity coordinators in one . In other primary studies care home staff were involved in delivering the intervention in 14 studies [33, 63, 66, 68, 86, 88, 93, 97, 106, 107, 111]. In the rest it was unclear who delivered the intervention (n = 5) or the intervention was delivered by researchers or outside facilitators (e.g. music therapists). The most lengthy and frequent sessions were reported in the Namaste Care studies, with several reporting interventions delivered for four hours seven days a week [8, 12, 27]. In non Namaste Care studies the mean length of a session (provided in 12 studies) was 29 min. Fifteen studies specified that the intervention was group based, in 18 it was not clear, and, in the remainder, it was delivered one-to-one. The most commonly reported resident outcomes were related to behavioural symptoms, agitation or mood. Few staff outcomes were reported. 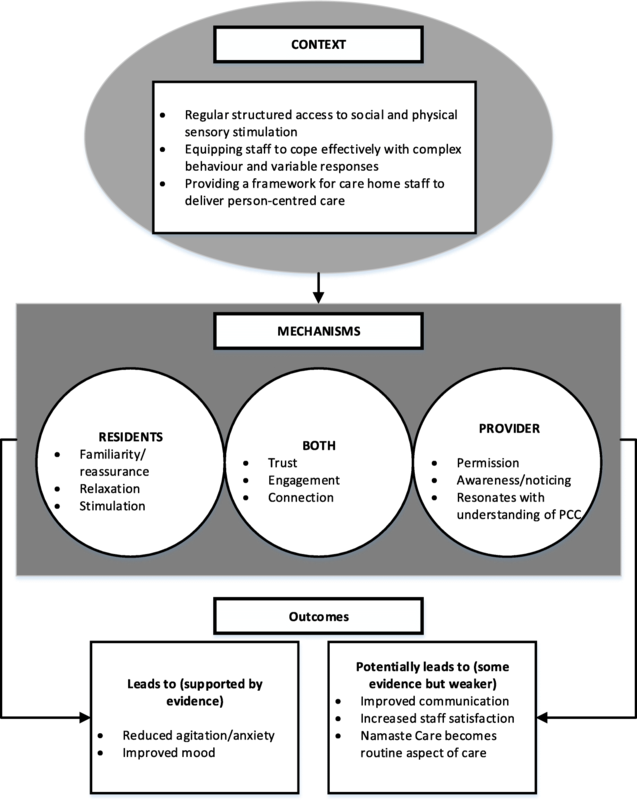 Our review resulted in three context-mechanism-outcomes configurations which together provide an account of how and why Namaste Care might work for people with advanced dementia. These are presented in Table 3 and summarized in Fig. 3. Interventions were delivered by a variety of different occupational groups; we use the term provider to encompass all these groups. Quotes from stakeholders relating to the CMOs can be seen in Table 4. • Staff notice/are more aware of the needs of residents. Programme theory: Care home interventions (e.g. Namaste Care) that provide regular and structured access to social and physical stimulation for residents with advanced dementia give staff permission to engage with residents outside of task-based care and improve resident outcomes (e.g. reduce agitation) through triggering responses such as familiarity, reassurance and trust. The evidence suggests that one of the most important aspects of programmes is how they enable meaningful relationships to form between providers and residents, for example by having the same person provide each session, incorporating one to one interaction into an activity and providers having skills to work with people with advanced dementia [33, 40, 66, 70, 75, 79, 88, 101, 104, 112]. In contrast interventions involving providers who are unfamiliar to residents and/or do not have appropriate skills [82, 83] or who are unable to engage socially with people with dementia  may be less effective. Stakeholders at the workshop suggested that having the same person deliver Namaste Care was not always practical but rather the aim should be to achieve a consistent approach and attitude towards programme delivery. Social stimulation appears to be a particularly key component of interventions. In a series of studies [52–58, 109] Cohen-Mansfield and colleagues evaluated a variety of stimuli for people with dementia living in care homes. They found that social stimulation, especially when it involved one to one interaction and the active participation of the resident, had the most dramatic effect on engagement and attention . The importance of one to one attention and social stimulation was also highlighted by other studies [79, 87, 104, 106]. In Namaste Care physical stimulation is provided through both the components of the intervention and the environment in which the programme is delivered. For example, scents and soft music were felt to be calming and soothing for residents [8, 12, 29]. Stakeholders supported this suggesting that the right space could help over-stimulated residents relax and encourage people who were withdrawn to ‘emerge from their shell’. Namaste Care studies suggested that soft lighting was also an important part of the intervention [8, 28, 29, 31] but Cohen-Mansfield et al. found that normal levels of lighting (rather than bright or dark) were associated with pleasures in people with dementia . Whilst some non Namaste Care studies referred to the importance of environment (for example having a private space or a quiet room) in many the space was not described (see Table 3). Studies however, did identify practical as well as therapeutic benefits to having a designated space, suggesting that sessions were less likely to be cancelled because of competing priorities and activities could take place as and when needed by the residents [75, 80]. However, whilst space might be an important context it is unlikely to trigger staff engagement without additional resources such as allocation of time and management support. A study evaluating the use of a sensory room for people with dementia (snoezelen) found that staff missed sessions because they did not see it as a priority . Stakeholders suggested that for Namaste Care to be achievable and adopted as a core part of the work of the care home it was important that staff were given permission, through appropriate allocation of time and resources, to engage with it. The originator of Namaste Care suggests that it should be delivered twice a day, seven days a week. Three non-randomised studies reported delivering Namaste Care in this way [8, 12, 27], although stakeholders suggested that this was unlikely to be feasible in most care homes in the UK. We found little empirical evidence on the optimal ‘dose’ of sensory interventions such as Namaste Care. The literature does, however, suggest that interventions that are delivered more regularly are important for creating a sense of reassurance and familiarity and building trusting relationships between residents and carers . This in turn may help to reduce agitation and anxiety in people with advanced dementia. A meta-analysis of music therapy found that sessions done twice a week had a more statistically significant impact on disruptive behaviours, anxiety and mood than weekly sessions . There was little evidence on the benefits of group versus one to one delivery. A meta-analysis of music therapy for people with dementia found group therapy had more positive effects on disruptive behaviours and anxiety than individual therapy . However, this analysis did not distinguish between those with and without severe dementia. One RCT found group music therapy was more effective for residents with mild and moderate dementia than those with severe dementia  and another suggested that it was more difficult to achieve therapeutic goals if the ratio of participants to therapist was too high (e.g. five residents to one therapist) . Programme theory: Interventions that include a ‘toolkit’ of multisensory activities equip staff to work effectively with residents with complex behaviours and variable responses leading to improvements in resident outcomes (e.g. reduced agitation) through triggering responses such as engagement and connection between residents and carers. The use of ‘loving touch’ is perceived to be key to Namaste Care, with touch thought to evoke an emotional response that leads to physical engagement . We found some evidence to suggest that touch (such as hand massage) can have a calming effect  reduce behavioural symptoms [52, 100], improve sleep  and increase engagement . Hand massage may be more effective than simulated social intervention (e.g. holding a doll) because the intervention combines one-to-one social interaction with sensory stimulation . Music also appears to trigger emotional responses in people with advanced dementia. There is evidence that receptivity to music can remain until the late stages of dementia . Primary studies [56, 68, 80, 89, 93] and reviews [34, 48] reported that music therapy improved communication and connection, increased engagement and reduced agitation [66, 68, 80, 112]. An advantage of music therapy is that it is inexpensive and easily implemented into care home activities . There is some evidence to suggest that the most effective interventions are those that equip care staff to cope effectively with the complexity of caring for people with advanced dementia. A systematic review of interventions to reduce agitation in people with dementia found that the complexity of behaviour associated with dementia required a multifaceted response that could be tailored to the needs of individuals . Stimulating a range of senses may be particularly important for people no longer able to verbalise , and as cognitive function deteriorates people with dementia can become very sensitive to sensory experiences [62, 63]. 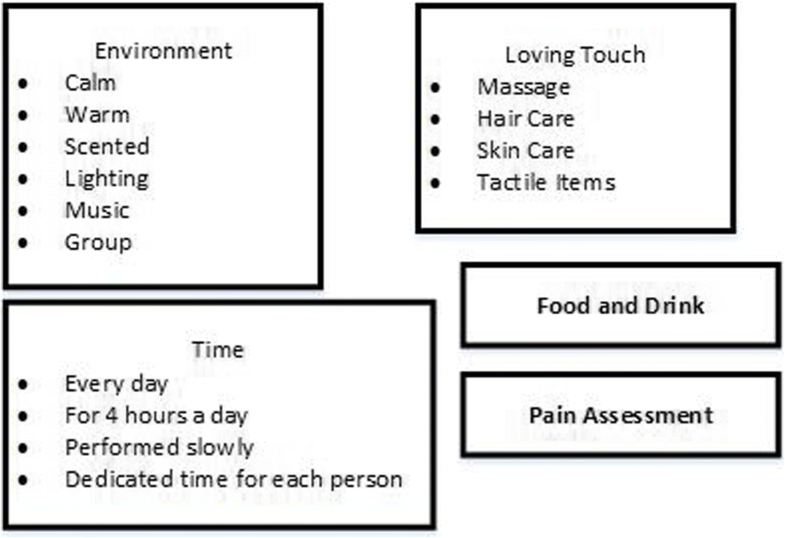 The multisensory nature of an intervention such as Namaste Care means that staff have a range of activities to draw on, giving residents choice in what is delivered and access to different stimulation (touch, auditory, olfactory and visual) [33, 40, 59, 62, 73] The assumption from this evidence is that it is the combined effect of being able to use a range of activities that triggers staff capacity and ability to respond to residents’ symptoms and behaviours and not individual activities. Programme theory: Multisensory interventions that focus attention on residents’ individual biographies and which attempt to connect with residents’ reality make staff more responsive to residents needs and lead to improvements in resident outcomes (such as increased responsiveness). Many studies highlighted the importance of individually tailored interventions and acknowledging that different people would respond differently to the same stimuli [8, 36, 40, 50, 83]. Such personalisation included attention paid to the environment in which an intervention was delivered ; the music being played [66, 92, 99, 108]; the aroma [64, 65, 83, 88, 93, 102] the way someone was touched [82, 83, 88, 106] and how they were spoken to [76, 101]. It was also considered to be important to consider people’s known habits and preferences, the stage of dementia that people presented with and whether current preferences may be different to previous habits [76, 80]. Individualising interventions (e.g. using past and current preferences) was reported to reduce agitation [40, 52, 107] and increase alertness or engagement . There was also evidence (although this was largely qualitative or anecdotal) that personalised interventions made staff notice more about residents and their abilities [10, 12, 33, 76], leading to improved communication between staff and residents [44, 50, 66, 70, 111],the development of trusting relationships between residents and caregivers [72, 75, 88] and a shift towards a more person-centred culture of care [10, 29]. In our original programme theory we hypothesised that Namaste Care would have benefits for family members, either through better connection with their family member with dementia or through improved communication with staff. Few studies measured outcomes for family members although there was some anecdotal and qualitative evidence that it improved connections between family members and residents [27, 31, 33, 67, 71, 76] and relatives and care home staff [27, 29, 33]. We have developed an explanation of how the Namaste Care intervention achieves particular outcomes, and in what circumstances. Our theory draws on three context-mechanism-outcome configurations that together provide an account of what needs to be in place for Namaste Care to work for people with advanced dementia. The CMOs highlight the importance of: delivering and structuring the intervention in a way that triggers feelings of familiarity and reassurance in residents, the involvement of providers with appropriate attitudes and skills, one-to-one engagement, and the incorporation of resident biographies and preferences into programme delivery. It also highlights the need to provide appropriate preparation and resources for staff to engage with the programme. A key overarching mechanism that emerged concerned the importance of activities that enabled the development of moments of connection for people with advanced dementia. This might be connection with a provider or member of staff, with a family member or with a memory through an activity such as music. The creators of Namaste Care proposed that it is delivered regularly and intensively, ideally twice a day, seven days a week . However, the evidence to support this is limited. We found only three non randomised studies evaluating an intervention of a similar intensity [8, 12, 27], and, whilst studies compared different active interventions none compared different doses of the same intervention. Moreover, stakeholders involved in delivering Namaste Care in care home settings suggested that delivering the intervention as originally intended is unlikely to be possible in many care homes. What our review does suggest is regular access to social and physical stimulation for people with advanced dementia triggers mechanisms such as familiarity, reassurance and recognition, which in turn leads to a reduction in agitation and behavioural symptoms. Regular engagement in multisensory interventions may be important as the evidence from the review, and from the wider literature, suggests that the impact on outcomes such as agitation may be short-lived [36, 52, 113]. Namaste Care is designed to be delivered to a group, albeit involving individual attention for residents. This is in part to reduce the isolation of care home residents with dementia by bringing them together to experience Namaste Care in a communal room. It was also considered preferable in terms of staffing levels . From our review there was insufficient evidence to say whether group delivery had therapeutic benefits or if it is just a more practical way of delivering an intervention in a care home. What does seem to be an essential context is the opportunity for meaningful one to one interaction between residents and carers . This interaction was more likely to create moments of connection if the provider had appropriate skills and was comfortable in social interactions with residents with advanced dementia. This review included studies looking at a variety of sensory interventions, including those that involved multiple activities and those that were focused on a single activity. The work by Cohen-Mansfield and colleagues [56–58] suggests that, whilst any type of stimulus is preferable to none, there may be a hierarchy of sensory stimuli with live social stimuli (involving one to one interaction) being most effective. Our theory suggests that one of the ways in which Namaste Care works is by providing a clear structure that gives staff both permission, and opportunity, to deliver person centred care. Previous research has found a person centred approach to dementia care is associated with improved outcomes for care home residents [107, 113, 115, 116]. In this review we found evidence to suggest that using biography and personal preferences were important contextual features of multisensory interventions because they helped to trigger the creation of connections for residents. As Namaste Care includes a range of activities we suggest that it is easier for staff to find activities that fit with individual preferences and responses. In our initial programme theory we hypothesised that being involved in the delivery of Namaste Care would improve staff outcomes, for example increasing satisfaction and confidence. Few studies measured these outcomes but it remains a plausible idea. Studies have found a positive association between implementing person-centred care strategies and a sense of staff confidence  and satisfaction . In developing our programme theory we focused primarily on Namaste Care rather than the wider care home environment. However, there is good evidence that organisational context in long-term care settings affects the uptake of healthcare innovation . Important contextual elements are alignment with care home priorities, senior management support at organisational and unit level, and care home staff having enough slack and flexibility to accommodate change into current workload. Namaste Care may require additional resources, particularly staff input, in the start-up phase . All of these are important in order for staff to feel that Namaste Care is a priority and part of the everyday work of the care home . There is a lack of research evaluating the impact of Namaste Care. However, the advantage of a realist approach is that the unit of analysis is the programme theory, or underpinning mechanism of action, rather than the intervention . This meant we were able to include a broader range of literature, such as interventions drawing on similar principles to Namaste Care. This provided opportunities for transferable learning and enabled us to develop a theory driven explanation that can be used to guide future initiatives and evaluations. There remain, however, unanswered questions about the effectiveness of Namaste Care. For example, we do not know what the impact is of involving family members in Namaste Care (or if it is feasible), whether food and drink are important, whether there is a therapeutic effect of group delivery, whether some stimuli are more effective than others, or how often Namaste Care needs to be delivered to be effective. Some of these questions will be explored further in a feasibility trial currently underway . In realist reviews the aim is not so much to summarise all the available evidence but rather to make sense of it. Searching tends, therefore, to be iterative and ongoing throughout the review process with the aim of identifying sufficient sources for theory building and testing. To identify studies for our review we undertook extensive database and lateral searching. Despite this it is possible that we missed potentially relevant literature. However, the nature of realist methodology means that there is not a finite set of relevant papers to be found. Instead the reviewer can take a more purposive approach to sampling that aims to reach conceptual saturation rather than identify all available documents . This review is the first Phase of a study assessing the feasibility of Namaste Care as an intervention for improving the quality of end of life care in care homes. Whilst some of the Namaste Care studies suggest that Namaste Care can support good pain management in people with advanced dementia [10, 12] few of the studies we included focused on end of life care or reported pain as an outcome. This is in line with other research which has found that there are few interventions which address the challenges that dying with dementia poses . Therefore, although we were able to develop a theory about how Namaste Care may improve quality of life for people with advanced dementia we do not know if, or how, it might improve end of life care. Our feasibility study will explore this further . Our realist review has shown that it is possible, using the available evidence, to develop and test a coherent account of how Namaste Care and similar multi-sensory interventions might work for people with advanced dementia living in long-term care settings. This review is important because it provides both practitioners and researchers with a framework to judge the feasibility and likely success of Namaste Care in long term settings. The proposed theoretical account of what works, why and in what circumstances is not final. As further relevant evidence emerges, it will be refined, challenged and developed further. Nevertheless, it is reasonable to conclude that the key mechanisms that Namaste Care triggers for residents are feelings of familiarity, reassurance, engagement and connection, and that for staff it gives them permission and awareness to engage with residents in a more person-centred way. This work is supported by the National Institute for Health Research (NIHR) HTA project reference: 15/10/11. This report presents independent research commissioned by the National Institute for Health Research (NIHR). The views and opinions expressed by authors in this publication are those of the authors and do not necessarily reflect those of the NHS, the NIHR, NETSCC, the HTA programme or the Department of Health. FB wrote the protocol, was involved in all aspects of the review process and wrote the paper, CG wrote the protocol, was involved in all aspects of the review process and helped to write the paper, JL was involved in all aspects of the review process and helped to write the paper, RS was involved in all aspects of the review process and critically reviewed the final paper, CW was involved in study design, interpretation of the results and critically reviewed the paper, NP was involved in study design, interpretation of the results and critically reviewed the paper, KF is the PI on the Namaste Care Trial, helped to write the protocol, was involved in study design, interpretation of the results and critically reviewed the paper. FB confirms that the manuscript is an honest, accurate, and transparent account of the study being reported, that no important aspects of the study have been omitted, and that any discrepancies from the review as planned have been explained. All authors read and approved the final manuscript. Research Ethics Committee approval was obtained from Lancaster University 17/wa/0378. Written consent was obtained from participants. All authors have completed the ICMJE uniform disclosure form at http://www.icmje.org/conflicts-of-interest/ and declare that they have no competing interests. Department of Health. Dementia: a state of the nation report on dementia care and support in England. 2013; November:68. https://assets.publishing.service.gov.uk/government/uploads/system/uploads/attachment_data/file/262139/Dementia.pdf. Rycroft-Malone J, McCormackB, Hutchinson AM, DeCorby K, Bucknall TK, Kent B, Schultz A, Snelgrove-Clarke E et al. Realist synthesis: illustrating the method for implementation. 2012;7:33. https://doi.org/10.1186/1748-5908-7-33research. Stacpoole M, Thompsell A, Hockley J, Christophers S. Toolkit for implementing the Namaste Care programme for people with advanced dementia living in care homes. 2016. https://www.stchristophers.org.uk/wp-content/uploads/2016/03/Namaste-Care-Programme-Toolkit-06.04.2016.pdf. Accessed 24 Jan 2017. Forrester LT, Maayan N, Orrell M, Spector AE, Buchan LD, Soares-Weiser K. Aromatherapy for dementia. Cochrane Database Syst Rev. 2014;(2):Cd003150. https://doi.org/10.1002/14651858.CD003150.pub2. 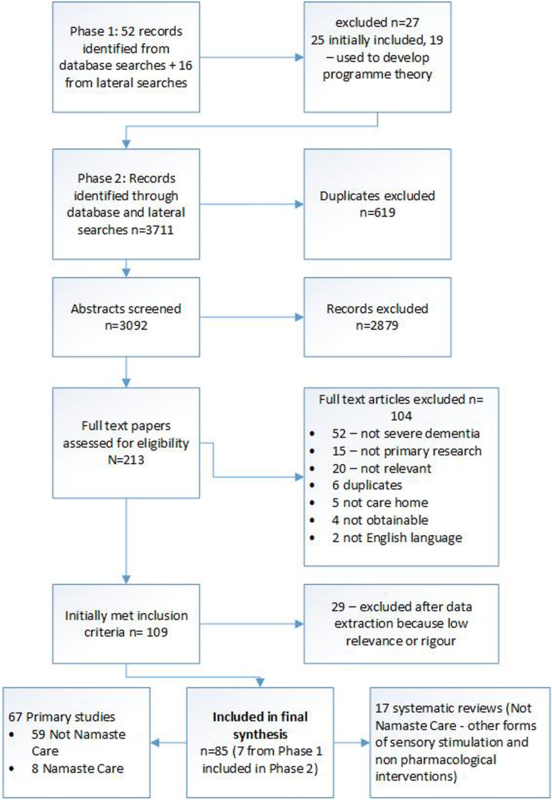 Berendonk C, Kaspar R, Bär M, Hoben M. Improving quality of work life for care providers by fostering the emotional well-being of persons with dementia: A cluster-randomized trial of a nursing intervention in German long-term care settings. Dementia. 2017;0(0):1-24. https://doi.org/10.1177/1471301217698837.